Today’s travelers reach for online recommendations to help them decide what tour or activity they should book. Travelers make their decisions by scrolling through Facebook, TripAdvisor and influencers’ reviews. First, let’s clarify who influencers and influencer marketing are, and how travel bloggers fit this category. These people have the power to influence other people’s choices and behavior. Such as, make them see how amazing your tours or activities are. If a large group of people that admire travel blogger sees him or her enjoying your tours and activities, many of them will copy this behavior. 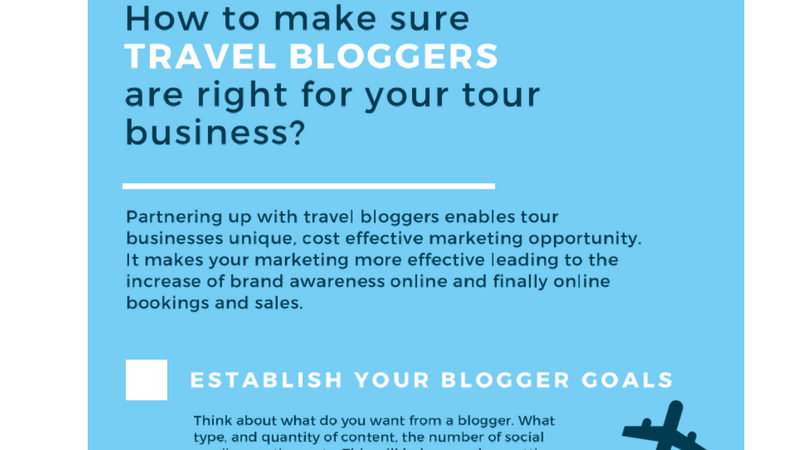 Also, partnering up with travel bloggers enables tour businesses, a unique, cost-effective marketing opportunity. It provides benefits for you such as an increase in brand awareness online. It makes your marketing more effective and, most importantly, leads to the increase of your bookings and sales. You want your tour business to partner with one or a few influencers, right? Here is a checklist to help you find them and make sure they are right for your business.